Nicky Carabott (right) and William Chetcuti. 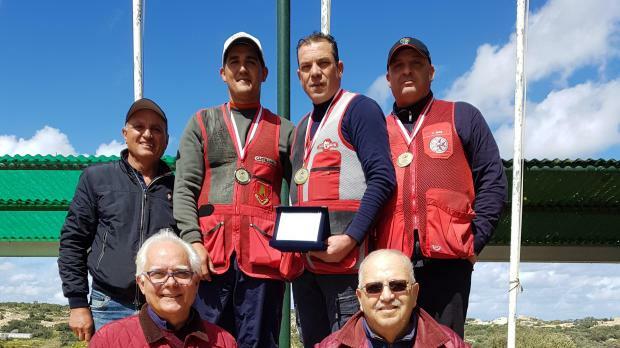 Nicky Carabott won the Muscat Cup Trap Selection organized by The Malta Shooting Sport Federation at Bidnija this weekend. Carabott managed a remarkable 43/50 single barreled in the final stages under strong windy conditions. William Chetcuti managed a straight of 25/25 in his first round of the qualifications on Saturday. 1. Nicky Carabott: 105/125 - 23-28-32-34-43. 2. William Chetcuti: 115/125 - 22-25-29-32-39. 3. Eugene Borg: 105/125 - 19-24-27. 4. Nazzareno Attard: 108/125 - 20-24-26. 5. Mario Buhagiar: 107/125 - 18-22. 6. Brian Galea: 110/125 - 17.